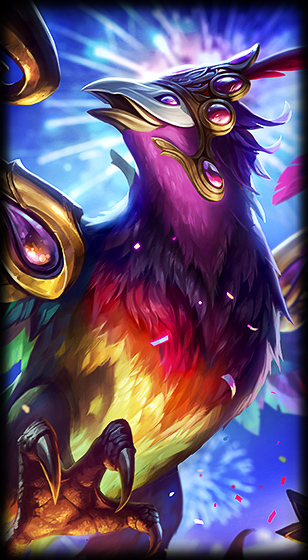 Surrender at 20: Festival Queen Anivia now available! "Let's soar." - Festival Queen Anivia is now available for 975 RP! Continue reading for more information and previews, including a behind the scenes article and wallpaper! From the official release announcement "The Festival's Muse has Landed"
You hatched the party from its egg. Dance into the enemy base as Festival Queen Anivia, now parading through the League store for 975 RP. 1500 IP (until 2/27/17, 23:59 PT) | 250 RP"
Over on the BR LoL site, there is also a Asas Da Folia page featuring the new skin and BR server exclusive promotions! Check out this behind-the-scenes look at how Festival Queen Anivia came to life! 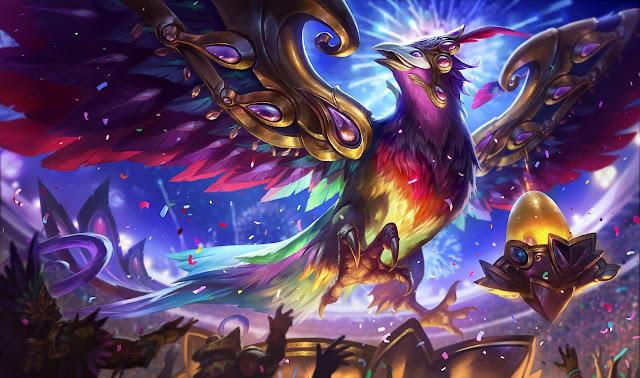 "After lots of talks between Riot teams in Brazil and the United States, we've released the newest culturally-inspired skin adapted for a global League of Legends audience: Festival Queen Anivia. She's left her cold and ancient Cryophoenix roots and stepped out as a radiant queen of the party. We bring you a look behind the curtains on this skin's inception and the Wings of Revelry animated short as well. Yearly celebrations like this happen all around the world. We've got Mardi Gras in the U.S., the Murgas in Argentina, the Russian Maslenitsa... well, lots of those! The Brazilian Carnaval gathers references from within and out of the country and is one of the most easily recognizable celebrations worldwide, even if it is portrayed differently by region or country. Jesica “Artsed” Paulin, a community creator from Argentina, says, "Although the city of Reconquista is small, it doesn't stop us from celebrating Carnaval." Hailing from the Santa Fe province, she chose Anivia for her fan art as the massive bird was her first main. "Back when I made the Ave Enmascarada ["Masked Bird" in Spanish] design, most of her skins had dark and dull color schemes; I thought it'd be nice to see her shine with some bright purples and pinks. "What inspired me to create this skin was the makeup and outfits dancers wear in the parades," says Arsted. "The first sketch was quite simple: colorful feathers and a mask covering her face. However, it evolved into a mask-like design for her wings, with more details based on the floats and dancers' frame headdresses." "We're just waiting for them to invite us"
After the Special Forces Gangplank launch, the Brazilian office ran a survey for Brazilian players: what did they expect from a culturally representative champion skin? Three elements were obvious: the first two, myths and nature, were used as guidelines for River Spirit Nami and Elderwood Hecarim. The last one, Carnaval, was still missing. 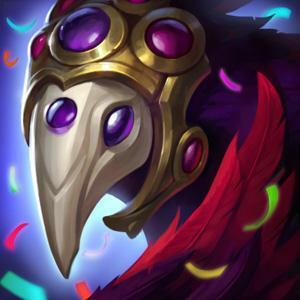 "We looked at a variety of concepts the Brazil and Latin America teams presented to the skins team, and there was a concept from a player in Argentina that we all really loved for Anivia," said Carlos "IamCarlos" Giffoni, product manager in the NA office. "We worked closely with the Brazil team to make sure we had a good understanding of the look and feel and what things were important to represent. We'd wanted to go and experience Carnaval in person. We are just waiting for the BR team to invite us." 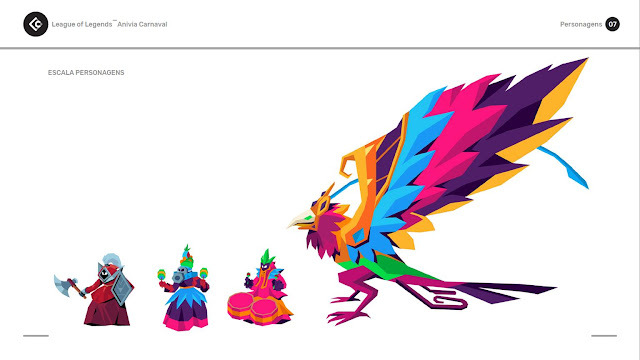 Concept artist Justin "RiotEarp" Albers took that South American inspiration and made it feel like a part of LoL. 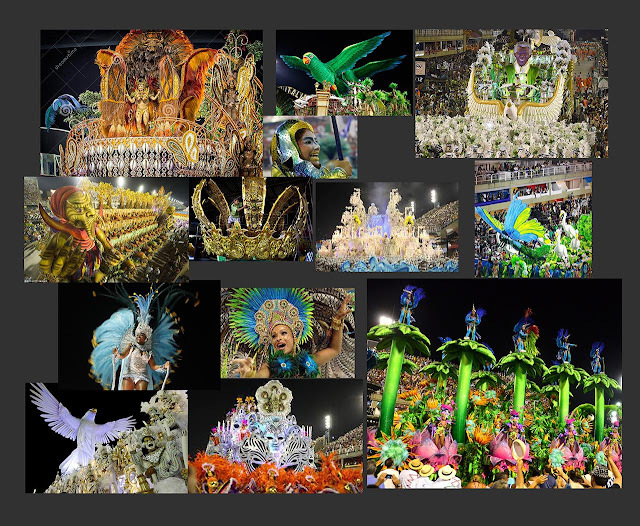 "We looked at Carnaval motifs, float statues, videos, birds-of-paradise (suggested by artist Jean “Riot Curing” Go), and looked into how each city celebrates Carnaval in its own way, just to get as much inspiration as possible." 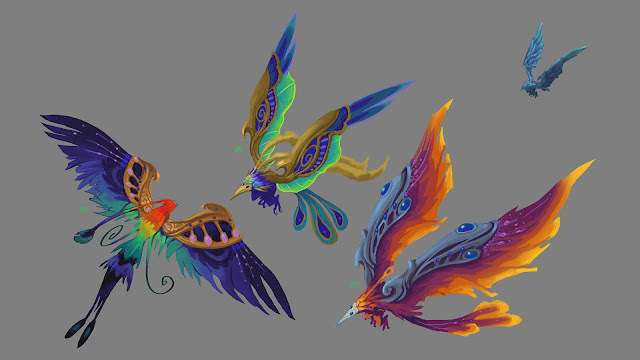 As Anivia is a classic champion, some changes were needed to make her flight animation work smoothly. "The recall took us a while to figure out as well. I knew we needed some samba music in there, but getting the right sequence of actions from all the pieces took a few rounds to get right," says IamCarlos. "The visual effects and additional sounds were pretty straightforward and fun to do. We are really happy with how she turned out and really hope players love it too, especially the Brazil and LATAM players!" Le Cube, an animation studio in Brazil and Argentina, launched the festivities with the Wings of Revelry animated short, proving that even the most grim and dark battlefield can become a lively, colorful place when there’s a party involved. According to Brazilian video producer Leo "RudaTargaryen" Rudá, one of the biggest challenges was the tight deadline. "We needed an even greater push from the animation team. We were constantly speaking. Also, this was their first video game related short! As this is a cascading production process, with lots of interdependencies, now and then we needed to realign and approve materials all of the time to publish the best content possible." "There was this meeting and we were switching around skipped through Portuguese, English and Spanish words," says RudaTargaryen. "These are moments when you learn to use different words to convey one particular concept." "Whenever we see different cultures working together, we get a full 360-degree view and not just Brazilian Carnaval for Brazilians," says RudaTargaryen. "These conversations happened across the BR, US and LATAM Riot offices, the Argentinian animation studio, and that has guaranteed a richer, varied and globally-appealing product, not limited to one single region.""